Looking for KitchenAid Food Grinder and Fruit/Vegetable Strainer in 2019? Scroll down this page and follow the links. And if you bring home some fruit or vegetables and want to can, freeze, make jam, salsa or pickles, see this page for simple, reliable, illustrated canning, freezing or preserving directions. There are plenty of other related resources, click on the resources dropdown above. The KitchenAid Food Grinder and Fruit/Vegetable Strainer set is an incredibly useful attachment for your KitchenAid Stand Mixer, but it does has some limitation. Below are phots of the various combinations. Scroll past that for all you need to know to get the best use out of it. The food grinder / fruit and vegetable strainer is actually 2 attachments combined to work together. First is the food grinder, which attaches directly to the KitchenAid Stand Mixer. It's job, rather obviously, is to grind whatever food is fed into it. That can range from meats to make sausage or hamburger, or fruit for jams or sauces or vegetables for purees. The second part of the set is the sieve. Basically it's just a screen. The auger (a long plastic screw) pushed the food into the sieve, forcing bits that fit through the openings out one way and larger pieces go out the end. You need the grinder attachment in order to use the sieve, but you do not need the sieve in order to use the grinder (as a grinder). 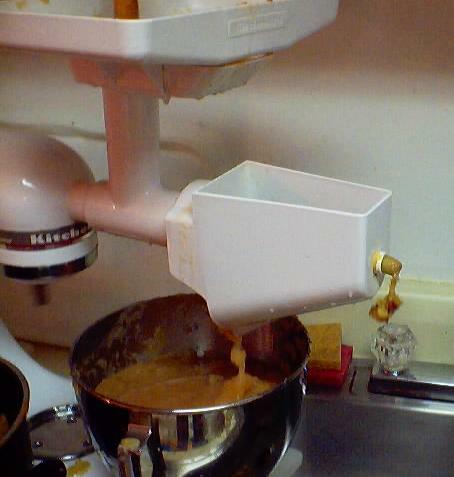 The sieve/grinder is perfect for making applesauce. (see this page for easy instructions about making applesauce with the Kitchenaid) I've found nothing else that compares with it. 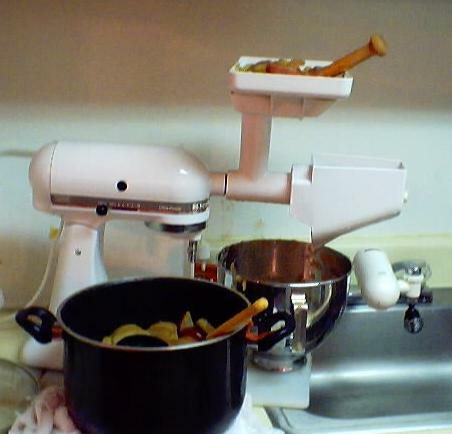 With this attachment, I have made over 100 quarts of applesauce and canned it, in one long day... by myself! The sieve grinder works best for foods like cooked apples: soft with a portiion that you desire (the cooked pulp) which easily passes through the sirves little holes, and other parts (stems, seedds, skins) which you want to separate. I haven't yet tried it for pitting cherries, but I suspect that if the cherries were cooked and still warm, but not hot, it would work well for that purpose. It's dreadful for thick substances in which the seeds (or other undesirable parts) do not easily separate from the pulp. An example of this is blackberries. The amount of wasted pulp is surreal. most of the blackberry passes out the end as waste. A Foley food mill actually works well for blackberries, especially if you heat them up a bit first to loosen the pulp (microwave or stovetop, just until hot). Raspberries are also a challenge for it, too. The seeds are small enough to pass through the sieve's holes and worse yet, they adhere so tightly to the fruit that most of the raspberry simply passes out the end.